Could Superman sue if someone exposed his identity as Clark Kent? Is a life sentence for an immortal like Apocalypse "cruel and unusual punishment?" Is X-ray vision a violation of search and seizure laws? Is the Joker legally insane? And who foots the bill when a hero destroys a skyscraper or two while defending Metropolis? Fear not, gentle listener! The answers to these questions and a multitude more are contained inside this audiobook. Lawyers by day and comic book enthusiasts by night, James Daily, J.D., and "Š"Š"ŠRyan Davidson, J.D., explain and explore the hypothetical legal ramifications of comic book tropes, characters, and powers, down to the most deliciously trivial detail. You'll learn about the basic principles of law in an engaging and accessible way through comics - from alternate universes and copyright laws to shape-shifters and witness testimony to contracts with the Devil. 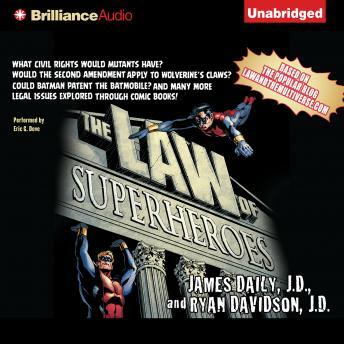 The Law of Superheroes is a must-listen for legal experts, true believers, and anyone who is ever called upon to practice law in the comic multiverse.